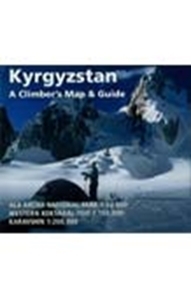 Detailed maps of 3 selected mountainous regions, noted for their appeal to climbers. 1:200,000 map of the Karavshin Valley, near the tangled borders of south-eastern Kyrgyzstan and Tijikistan. 1:150,000 map of the Western Kokshaal-Too, in the Tien Shan range. (Shown in cartography sample below). 1:50,000 map of the Ala-Archa National Park, south of Bishkek. The maps have been compiled from Russian topographic maps, satellite imagery and ground data. Relief is shown by hill-shading, contours and spot heights. Detail includes passes, peak names, base camps, huts, villages, tracks, roads, borders. Latitude and longitude margin ticks are included, also UTM grid lines on the two larger scale maps. The maps are complemented with information on geography, climbing opportunities and practical advice for visitors.